Three new guides have been added to the site to help you get started improving your sight reading. If you have an idea, get in touch! Two keyboard shortcuts have been added to the Create page to make practicing easier. Hitting the [Space Bar] will start and pause the audio file. Hitting [R] will refresh the page and provide a new set of music to practice. A vocalist recently suggested having a starting triad before the piece plays. You can choose from a single pitch, major triad or minor triad. After you have logged in, visit the Listening Settings page the turn the starting pitch on under the Melody Playback Options section. Do you to change the tempo or switch clefs frequently? Now you can change these settings, and others, right from the Practice page. On the Listening Settings page, tick the checkbox to the left of the option and it will show up on the Practice page. The metronome has been expanded into two options: quarter notes and eighth notes. If you have ever thought about being awesome at 5/8 or 7/8 time, this is a great way to practice! 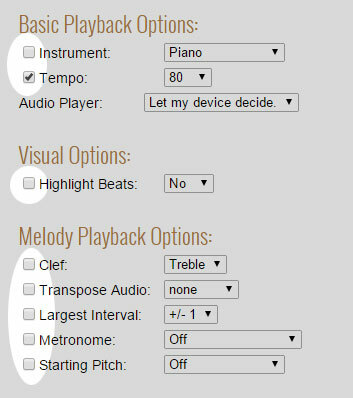 To change your metronome settings, sign in, and go to the Listen Settings page. From there you can update the Metronome settings! Check it out and feel free to leave feedback! A new feature called "Highlight Beats" has been added to the "Listening Settings" page. This feature will put a line on the beat so counting is easier. If you have been thinking about trying a more complex meter, such as 7/8, this will help you keep track of the beats! Just sign in to your deluxe account and go to the "Listening Settings" page. Don't have a deluxe account, sign up for a free week trial. There have been a few sixteenth note additions added this week. Check them out in level 5, or in add them to your custom level! If you have any suggestions for additions, please use the "Contact" link. In the last update, audio will now play on apple and android devices. This feature has also been expanded to desktop machines that had problems with Quicktime and Windows Media Player. If you have had audio problems in the past, please try the new HTML5 player, or the new Flash player! This update helps those musicians who are using the site on mobile devices. The formatting of the staffs will be the same size as the desktop and a "Play" button has been added near the top of the page. Finally, the formatting of the staff and beats has been updated for both the free and deluxe versions. Beat one will always line up at the start of the measure, and the upbeat will always be inline as well. 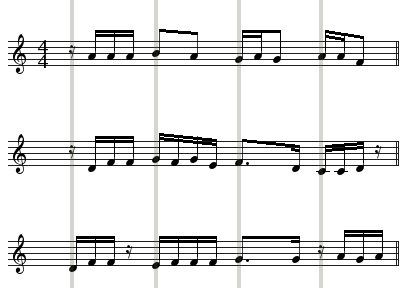 For simpler rhythms, the beats are more spread out, but this will help upcoming updates, such as accidentals! If you have any trouble, questions or comments about these updates, or any of PracticeSightReading.com, please use the Contact link. An update was released today that will allow ipad, ipod and iphone users to hear the audio. This feature is in beta, which means that there could be slight bugs in it. If you believe you found one, please use the contact link. 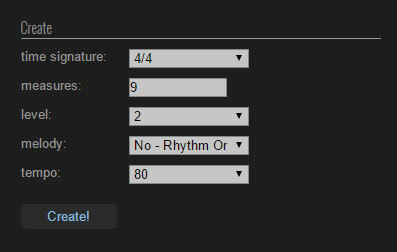 These came as a user suggestion, if you have any suggestions for rhythms to add, please let me know! Many people have been asking about key signatures and accidentals. Today I am happy to announce that key signatures have been added. You can chose from 15 different key signatures in all four clefs. Accidentals will be included in the next major version, so stay tuned for that. I have tested each key signature in the four different clefs; however, I was not able to test them with all the available transpositions. As a result, the key signature of C# in Tenor clef with a transposition of +/- Tri-tone was not tested. I am confident that it they all work correctly, but if you find a mistake, please let me know.